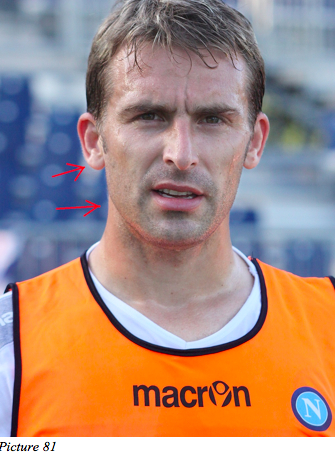 Hugo Campagnaro is a soccer player on the Napoli team who has a lateral deviation of the jaw to the right. In fact, we can see in Photo 81 that his features on the right are much more developed. Giuseppe Rossi is a soccer player on the Italian National Team who is incredibly talented, and a great scorer. Unfortunately, however, he has frequent injuries due to his asymmetry, which weighs down one side of his body more than the other. This displacement makes him particularly vulnerable to injuries. 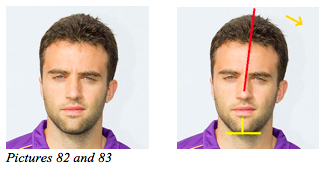 In fact, in Photo 83, one can see how Giuseppe Rossi deviates laterally to the left. This lateral deviation causes the muscles on the left side of his face to be shorter and stronger. In this situation the masseter muscle on the left pulls the ear, the scalp, the eye, the nose and the lips towards itself. This trend is quite visible in his face. As we have seen in the previous sections of the book it is clear that such a displacement in the face involves the rest of the body. I hope that Giuseppe reads this book and realigns himself in such a way that the Italian soccer team can have a great scorer who won’t have any more injuries. 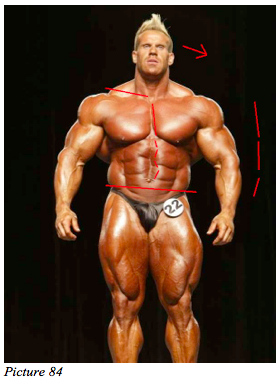 Even those athletes who appear to be perfect are in fact not symmetrical. Jay Cutler is an example of a body builder who dedicates most of his own time to training his body. Above all, that sort of discipline demands a symmetrical body in order to be successful at it. In fact, judges at competitions place great importance on symmetry, more than on volume or proportions. No matter how much athletes like Cutler dedicate themselves to training they can never achieve perfect symmetry without getting to the root of the problem. In any case, Jay Cutler has the great fortune to be one of the most balanced of individuals on earth, and it is for this reason that he can develop such muscle mass. on earth, and it is for this reason that he can develop such muscle mass.